All of us face daily challenges to our long-term health: from the pollutants we breathe, the chemicals in our food, the electronics all around, and the sheer pressure of daily life. Whether you notice it or not, your body is crying for nourishment. 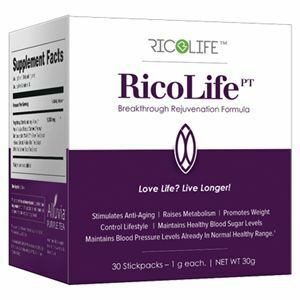 RicoLife is the perfect fuel for repair, refreshment and rejuvenation. 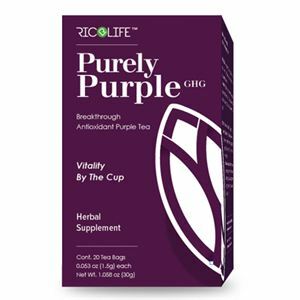 With 100mg of purple tea, it delivers a daily dose of the antioxidants GHG* and anthocyanins, which are proven to have powerful rejuvenating effects. Simply dissolve the powder in hot or iced water. 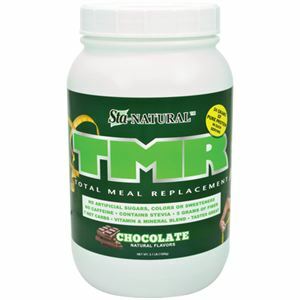 Get ready for more vitality, stronger immunity, clearer thinking and just feeling good all over! Proprietary Blend (Alluvia™ Purple Tea Leaf Extract Standardized for 3% GHG™, Green tea extract, Hibiscus extract, Rooibos red tea extract, White tea extract, Black tea extract, Stevia.